The Eye of the Storm. Gabriella "La Tempestad", captured by Bhavin Userofreality. To quote "The Ten Books of Architecture" by the Roman architect Vitruvius (Marcus Vitruvius Pollio, ca. 90 BC - ca. 90 BC): "The architect should be equipped with knowledge of many branches of study and varied kinds of learning, for it is by his judgement that all work done by the other arts is put to test." Vitruvius then goes on to list the many arts and skills in which an architect should be well versed (Drawing, Geometry, History, Philosophy, Music, Medicine, Law, Astronomy) because "It follows, therefore, that architects who have aimed at acquiring manual skill without scholarship have never been able to reach a position of authority to correspond to their pains, while those who relied only upon theories and scholarship were obviously hunting the shadow, not the substance. But those who have a thorough knowledge of both, like men armed at all points, have the sooner attained their object and carried authority with them." I happen to take Vitruvius's advice on the education of the architect very seriously, and if at times the contents of this blog seem random and unrelated it is because my interests, as Polia suggests (a play on Greek words that one day I will explain) are many. I believe that Architecture is informed by so many other subjects outside of Architecture herself, and sometimes I feel that one has to practice those subjects (perhaps not medicine) in order to understand them. Cuadro La Tempestad. From Left: Joyce "La Joya" Wilkenfeld, Marisol Monasterio, "El Maestro" Guillermo Serpas, Nadia Palacios Lauterbach, "La Tempestad", Eya Tkachenko. Photo by Alejandro Almanza taken at 14 Pews Theatre in Norhill, The Heights. Houston, Texas. One of the many other subjects I practice is music and dance. I started on the piano when I was 8, and danced Nicaraguan folkloric dances until the end of high school. These days you will find me singing and dancing Flamenco with Cuadro La Tempestad, the professional company from Del Espadín Flamenco and Spanish Dance Academy in Houston Texas. Cuadro is led by acclaimed dancer Gabriella Aliberti, "La Tempestad", whose stage name (The Storm) was bestowed on her the old fashioned and proper way: by a gypsy who saw her dance and said "you are like a storm". Tempestad lives up to her name. In her dancing she combines technical precision with artistic spontaneity. She is delicate one moment, forceful the next; refined one beat or completely raw at another turn. Sometimes she dances with such violent, brutal passion and at others, "the storm" stands still and it is the slightest of hand movements that have the most meaning. A clip from "Great Day Houston, with Deborah Duncan". NBC Houston. Guillermo Serpas follows Tempestad with his "toque". DP: Tell me Tempestad, when did you start in Flamenco and what made you? My mother (María del Espadín) is the first reason I got into flamenco. She always adored dancing, almost any form actually, especially since she comes from a long line of dancers and musicians. When I was 4 years old she enrolled me in ballet classes at Neubert Ballet Institute of Carnegie Hall. While I was attending my ballet class, she would observe the flamenco classes going on in the studio down the hall. She first enrolled my older sister in classes (youngest age International Studios accepted for flamenco was age 6) and then me 2 years later. I was so excited to dance wearing a pretty red ruffly skirt, high heels and playing the "cha-chas" (the word my sister and I used for castanets). After only a few classes, even as a young child, I was hooked. The rest is pretty much history. DP: Mundane question, because people like numbers. How much time do you spend practicing? besides teaching and performances, on your own I mean? Not nearly as much as I should to be called a professional dancer. Balancing Law and dance...performances, teaching, coaching, managing dance companies, running the studio...getting in practice for myself can be quite a challenge. If I get in 2-4 hours in a week, I'm good. DP: Wow, busy life! More numbers; how many pairs of shoes? Dresses? Vestido de Lunares. Tempestad captured by Henry Swasey. DP: I understand that one needs some endurance to participate in Flamenco, is it hard on the body, can it cause you pain? Flamenco is definitely physically demanding. The only other activity I've tried that rivals it is capoeira. It isn't painful (well, some movement has become painful because of my car accident injuries...but that goes for any kind of movement, not just any associated with flamenco), but it can take a toll on you. Most of the time, performance venues are not very conducive for the type of physical activity required by flamenco...i.e. stages built over concrete, venues wanting 3 hour long shows, etc. 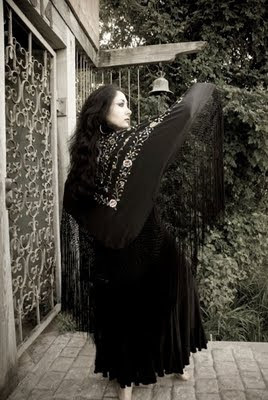 ; but flamenco itself keeps a person very strong. I have had teachers well into their 60s and 70s that have been dancing and performing since they were children and they just keep on going. DP: You and your mom call yourselves practitioners of "Flamenco Puro", would you tell me, what is Flamenco Puro? Flamenco puro means "pure flamenco" or what the gypsies, the people who created flamenco, "practice". 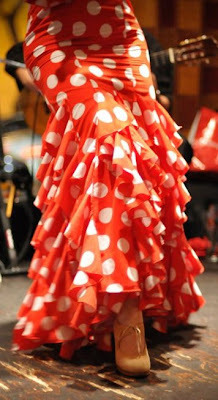 The flamenco puro is an expression of life, or rather a way of life. Today flamenco has been, in my opinion, commercialized, bastardized, mutilated....can you tell i'm a purist?....it has been fused with many other genres as far as the music is concerned. The dance has become androgynous and more of an acrobatic feat rather than an expression of emotion or artistry. I can appreciate the newer music but I don't think it should be called flamenco. It may have elements of flamenco but it is not flamenco. The essentials of flamenco puro are gone, it is no longer a culture, it has become an "art form", "music form", a "term". In a way, I'm glad that it is regarded as an art, but not glad that it is at the expense of the culture that created it. Its creators should be given that respect, don't take it away from them and "say thanks, now we're going to make this into something that really matters, now we're going to make this art". That I have no respect for. 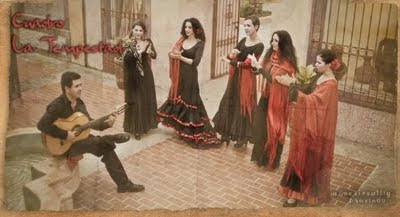 The gypsies, I do respect; and that is why I practice flamenco puro...or at least I do my best at keeping what I do. DP: What inspires you? What moves you? Ah...That's a hard one. I think what inspires me the most is the lack of inhibition that flamenco provides. It is completely based on everyday life and everyday emotions. No one judges anyone, but at the same time there's nothing "touchy-feely" about it or "kumbaya" about it. Everybody just gets to be real. It is what it is...sin frontera (without limits) and no one is going to tell you yes or no about it. DP: Who are your idols? MANUELA CARRASCO. I repeat! MANUELA CARRASCO. Not only is she a phenomenon, but she sticks to the real thing! 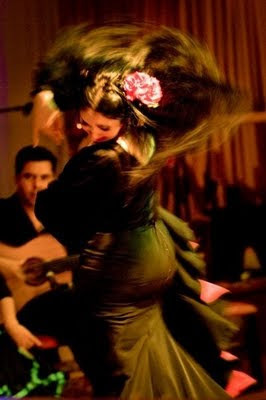 She is the only performer out there that has never diverted from flamenco puro. Not once. DP: I agree, she is AMAZING. "La diosa"; I could watch her all day! And how does Flamenco make you feel? Flamenco makes me feel everything. Sometimes I can feel like I'm floating that one could knock me over with a feather. Other times I feel like the most powerful being. It runs the gamut...ecstatic to spiraling depression...sometimes stuck in the middle...complete indifference and lost in thought somewhere, just going through the motions; sometimes not seeing clearly where all is a blur and movement and expression are my guides. How I dance completely depends on where my mind and my heart are at the time. Flamenco is completely personal to me and is mine. Probably the only thing I do in my life that doesn't have to be done for anyone but me. DP: It is interesting you say that everything is a blur and sometimes just your emotions guide you; because I remember for Houston Artopia 2010, when your dad was so ill at the hospital, you danced like his life depended on it. It was the best Alegrías I've seen you do, and I told you that, and you said to me "really? it was all a blur". You just wanted to get back to your Papa. DP: So I'm coming to understand that there are a lot of things people don't suspect hidden under a performance. What about a "pep-talk"? Some dancers do that. What do you think before you get up from that chair and we say "Ale Tempestad"? Just about anything!! Having been on the stage so long, sometimes I forget I'm up there and not on my living room couch. There is no conscious effort of "OK I'm on stage. I'm about to dance tango. I have to get myself psyched and focused." Nothing like that. There is no distinction between being on stage and not. Stage is just the means to complete freedom of expression. I hear the compás and things just take over. But that can be on stage or while I'm doing the laundry or talking to friends or walking. The compás (rhythm) is always there to dance to. It is also hard to control what you're feeling when you're up there. Depending on what's going on in my life or my surroundings I might feel a lot deeper than usual. I've been moved to extremes of a feeling, both happy and sad many times and that will come out on stage. There really are no checks and balances as to emotion in flamenco. DP: So when you are performing, you really are just living in Flamenco, and that just goes along with the idea that Flamenco is a way of life, something that you practice. And you have been living in Flamenco all your life, so you must have had a few "moments", which here at Dear Polia we like to call "Surreal Moments". Are there any you'd like to share? Meeting Manuela Carrasco. Learning from her after watching her incessantly since I was 12 was amazing! It was surreal every time she would stop the class to ask me to demonstrate. I could have been on cloud 9. Someone could have told me my flamenco life would end right there and I would have been completely satisfied. To gain approval from my idol capped it off for me. DP: Ahh..."La Diosa"; Manuela she is awesome, did I already mention that? Flamenco Puro, Flamenco de verdad señores! Ok, I'm digressing. So you have your own perfoming company I hear, with an appropriately traditional Flamenco name: Cuadro La Tempestad. Yes, Cuadro is really an amazing group of young flamencos. After my accident (Gabriella suffered multiple injuries and fractures to her leg, hand, and ribs in 2008) when I was left high and dry by my former company, I had to put together a company in a matter of months, while still healing myself. I basically chose the "best and the brightest" from my mom's studio and coached them into being the top flamenco performing company in Houston. No other company in Houston has received the accolades Cuadro has received, especially in such little time. 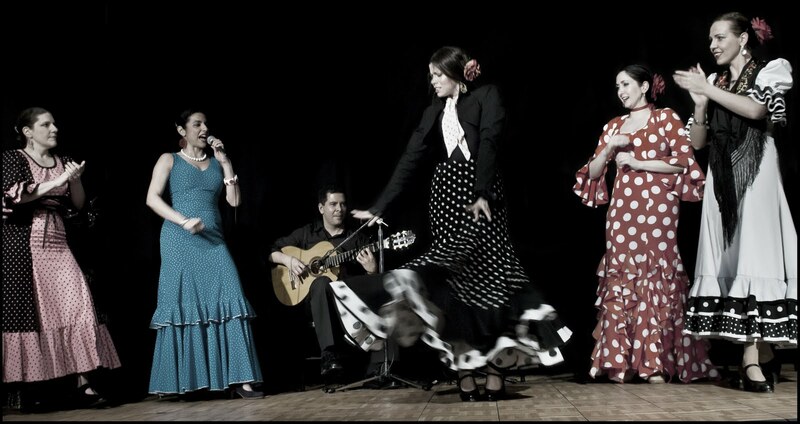 Cuadro is made up of truly dedicated individuals that believe in flamenco puro first. They all respect it and love it. This comes through in their effort and their performances. I feel that I'm blessed to have such a wonderful and talented group. Cuadro is like the phoenix to me. After my car accident, I thought I had nothing, especially since people that called me family ran out on me to satisfy their own egos. I was left wondering if I could ever be able to dance again myself, let alone have a performing company. So just when everything seemed at its worst, Cuadro came into existence..."out of the ashes, the phoenix shall rise". DP: I think Cuadro has a great motivation and inspiration in you; You couldn't walk, move your torso, and had surgery on your arm after your accident (which still cramps when you dance, not that anyone can notice); but you came back with a vengeance, with the desire to not only be as good as you were before, but to be even better. La Tempestad en reposo. Photo by Bhavin Userofreality. DP: Do you have any parting words of wisdom? When talking about flamenco people need to keep things real. It is real. It's not about putting on a special dress and special shoes and to wow the crowd. I would get up on the stage in jeans and flats and dance my heart out because it is the best high I could ever experience. As a matter of fact, I wish I could get up on the stage in comfy jeans and dance barefoot! That would be the best! So I try to keep it as real as possible. When people come to see me dance, it is what it is. I don't strive to impress or be the best. I just want to do flamenco. I just want to dance, and if people are watching, great, I hope they like it. Cuadro La Tempestad. Image by Bhavin Userofreality. Saturday May 21st in The Heights. What a very fascinating and informative post in which, in the interview, you give an insight into a whole area which is, for the most part, and in our belief, outside of most people's experience. This is all most interesting.